September is nearly here, so bring on the apples! Add some savoury ham and/or cream cheese, roll it all up with a crêpe, and breakfast becomes almost as much fun as a Seuss book! In the house or in a car, eat them, eat them; here they are! Crêpes in a car? Is there a way? All you need is a stick I say. Crêpes can brighten anyone’s morning; they also are an ideal breakfast component to make ahead of time. On the weekend or during an evening show, whip up a stack to stow in the fridge or freezer (but see this post for storage tips). Then become a morning hero, with sweet and savoury crêpes ready to roll as you start the day. Now I grew up with Swedish pancakes, which are basically the same as crêpes; they are only made from wheat flour though. French crêpes, on the other hand, have a dual tradition, with savoury crêpes made from gluten-free buckwheat flour, as well as sweet crêpes that are wheat-based. I am all about reducing my gluten consumption these days, but most buckwheat crêpes aren’t as flexible and friendly to rolling as the pancakes from my childhood. So these new and improved gluten-free crêpes were developed with flour ratios that help them flex and roll just right. Since buckwheat is a seed and tapioca is a starch, these crepes qualify as grain-free too. If, however, you prefer the classic wheat-based crêpes, you may use my simple recipe for Sunshine Crêpes. Both recipes give wonderful results for spearing on a stick. Whisk eggs and milk together until smooth. Add flours* and salt and beat or whisk until a smooth, thin batter forms, adding a little more water or milk if needed. Sprinkle lemon juice on apples and saute them with butter or oil for several minutes, until the apples are softened but not mushy. Let apples cool. Place a slice of ham in the center of a crepe and roll up. For vegetarian crepes, spread crêpe with softened cream cheese and roll up. Slice each crepe at 2 cm intervals to form round pinwheels. Cut each apple slice in half and spear through with a sharp knife tip. 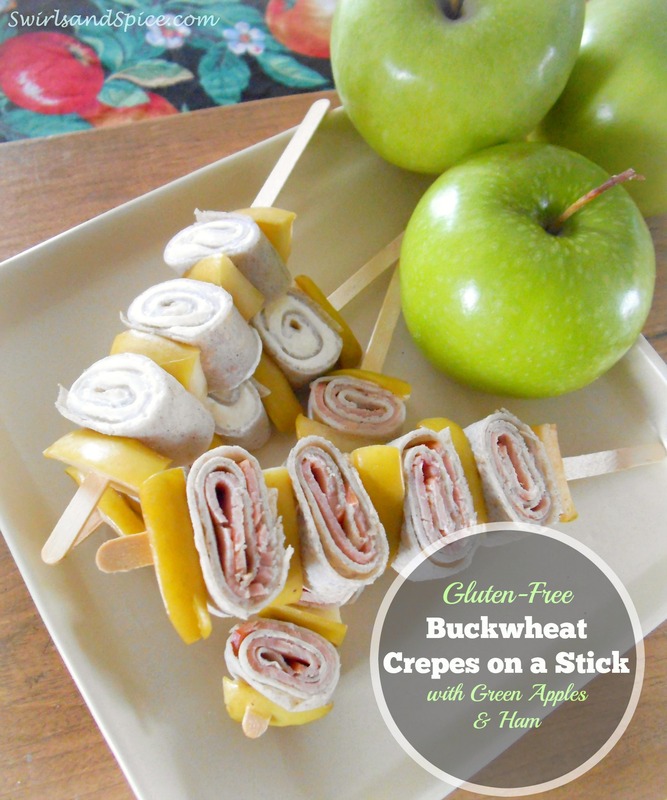 Thread crêpe pinwheels and apples onto wooden skewers or stir sticks. Cover until ready to serve. If tightly wrapped or kept in an airtight container, these can be refrigerated and served the next day. * If you prefer to make crêpes that are not gluten-free, use this recipe. * Cream cheese may be sweetened to taste with maple syrup or caramel sauce. This recipe may be shared here and at Allergy Free Wednesdays. What a fun idea to put the crepes on a stick! Thanks! I hope you get to enjoy them in the coming weeks. I’m ready for apple season too! This is a great way to kick it off! Portable crepes – love it! Thanks, Reeni! If state fairs can put hot dish on a stick, why not crepes? It solves the puzzle of how to eat them. What an original & fun idea! These are a fun skewers to make! Thanks for being such a friendly hostess! I’ve linked up a delicious new recipe for homemade applesauce. Enjoy your long weekend! I have been skewering everything it seems these days, and lunch on a stick is on my to do list! I love your combination! Great idea! Thanks for linking up to Sweet and Savoury Sunday, stop by and link up again. Have a great day! !